A Russian cargo freighter flying on autopilot performed a successful rendezvous and docking with the space station this morning, delivering two-and-a-half tons of supplies for the international outpost in uneventful fashion. The Progress M-07M spacecraft linked up to the aft docking port of the station's Zvezda service module at 7:58 a.m. EDT (1158 GMT) while soaring 216 miles over Mongolia. "Docking confirmed," NASA commentator Rob Navias announced from Houston's Mission Control Center. "A textbook approach and rendezvous for the Progress 39 cargo craft." 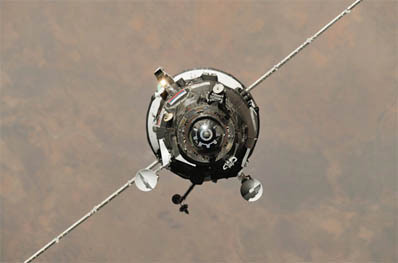 There was no repeat of the communications problem that interfered with the previous resupply ship's rendezvous in July. "Everything went by the book today. No problems encountered, no commanding issues encountered as was the case in July. It all went smooth as silk," Navias said. 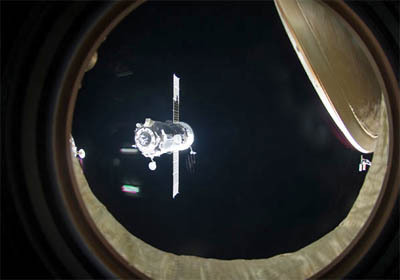 The Expedition 24 crew of commander Alexander Skvortsov, Russian cosmonauts Mikhail Kornienko and Fyodor Yurchikhin, and NASA astronauts Tracy Caldwell Dyson, Doug Wheelock and Shannon Walker plan to open hatches and enter the Progress later today. The cargo includes 2,645 pounds of equipment, food, clothing, life support system gear, 1,918 pounds of propellant to replenish reservoirs that feed the Russian maneuvering thrusters, 375 pounds of water and some 110 pounds of oxygen and air for the station's atmosphere. The Progress was launched Friday atop a Soyuz rocket from Baikonur Cosmodrome, reaching a preliminary orbit of 148 by 121 miles. A series of precise engine firings over the past two days guided the freighter to the rendezvous. After arriving in range of the space station, the vessel began a flyaround maneuver to get lined up with the docking port and then executed a roll maneuver to properly orient its forward docking probe with Zvezda. A brief stationkeeping hold with about 550 feet between the freighter and station allowed Russian flight controllers to assess systems before giving approval to commence the 11-minute final approach. The ship's automated docking system did its job and drove the craft to the linkup just before an orbital sunset. "Everything is nominal," a one of the cosmonauts reported as the Progress closed in. "One meter... and we have contact." It is the 39th Progress to dock with the station over its decade-long life and the fourth of five now scheduled for this year. The craft joins an earlier resupply ship that arrived in May and remains affixed to the outpost, plus two Soyuz crew transport capsules currently residing at the space station. Skvortsov, Kornienko and Caldwell Dyson will soon wrap up their half-year mission and return to Earth. Undocking is planned for September 23 at 9:34 p.m. and landing occurs a few hours later at 12:55 a.m. That signals the start of Expedition 25 with Wheelock as the new commander. The next three-man team -- Scott Kelly, Alexander Kaleri and Oleg Skripochka -- will launch from Baikonur on October 7 at 7:10 p.m. and dock October 9 at 8:01 p.m. EDT. The Progress 40P launch is targeted for October 27, just five days before space shuttle Discovery blasts off for its final voyage before retirement.